princiss and lewis are planning a formal wedding ceremony and a large sit down dinner reception celebrating their marriage with dancing to close down the night. for their save the dates, we kept the black and white palette very formal and highlighted their gorgeous engagement photos. 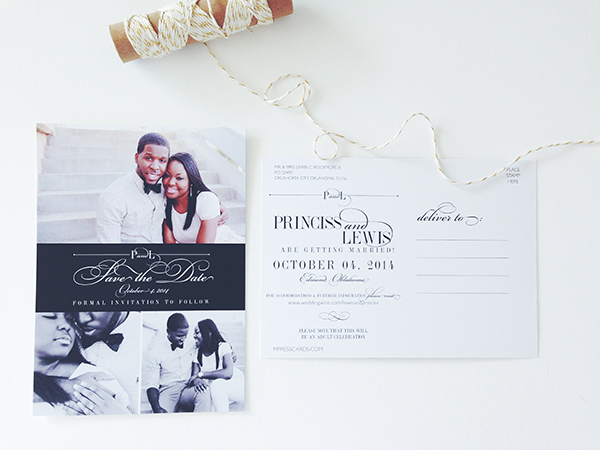 the back of the save the date is a postcard highlighting their wedding date, wedding website and more details! i can't wait to start on their wedding suite design for this adorable couple!